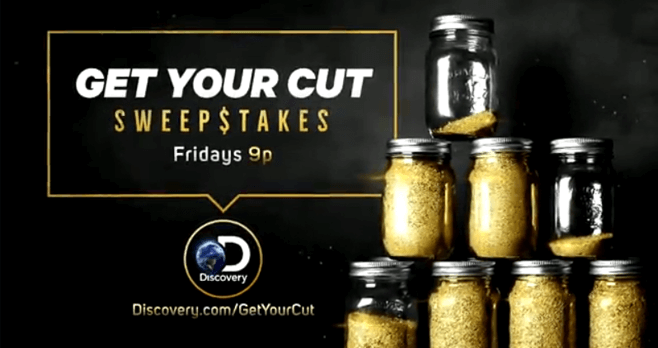 Discovery Channel announced the Gold Rush Get Your Cut Sweepstakes during the premiere of the 7th season on Friday, October 14th. Starting on October 21st, watch an all-new episode for the secret code then enter online at Discovery.com/GetYourCut for a chance to take home a cut of the gold. One very lucky viewer will take home up to $90,000 in cash. In addition, a new winner will receive a $100 Gold Rush-themed prize pack each week during the season. Participation into the Discovery Gold Rush Get Your Cut Sweepstakes is offered only to legal U.S. residents. Additionally, all participants must be the age of 18 and older at the time of entry. The Sweepstakes consists of 19 Weekly Entry Periods running from 9:00 PM Eastern Time on October 21, 2016 through 3:00 AM ET on March 4, 2017. Each Weekly Entry Period begins at 9:00 PM ET on Friday and end at 8:59 PM ET the following Friday, except for the Entry Period which begins at 9:00 PM ET on December 16, 2017 (will not end until 8:59 PM ET on December 30, 2017) and the Entry Period which begins at 9:00 PM ET on March 3, 2017 (will end at 3:00 AM ET on March 4, 2017). No more than one entry per participant will be accepted during each Weekly Entry Period. Grand Prize winner will be selected during a random drawing from among all eligible entries received during the Sweepstakes Period, on or about March 6, 2017. Watch Gold Rush each week starting on Friday, October 21st for the secret code. A new code will be displayed onscreen every Friday so keep watching all season long. Then, when you spotted the code, go online to Discovery.com/GetYourCut to enter the Discovery Channel Gold Rush Get Your Cut Sweepstakes. Follow the instructions to complete and submit the registration, including the secret code, to be entered. For complete details, including Official Rules, visit discovery.com/GetYourCut. #GoldRushProud Contest – Are you #GoldRushProud ? Absolutely Love, Love Gold Rush!???????????????? I am having to see a Psychiatrist because of my Gold Rush addiction.I have NEVER missed an episode since the series began. Keep it up!!!!!!!!!!!!!!!!!!! I have never seen the Secret Code on T V after the show. I have to get it off the internet. If they are doing weekly drawings according to there rules they say they will announce the winners weekly . but if they do i don’t get those on are broadcast either . Whats up?????????????????? ?